Graduates of our Tourism and Travel program may be employed in a wide range of settings and under a variety of job titles in the Tourism Industry. While many of these positions require specific knowledge or a higher level of a particular skill, it is clear that a cluster of common skills, knowledge, and attitudes essential to all entry‐level employees in the Tourism Industry, have been identified. Participants of this program will learn effective interpersonal skills, strong sales abilities, capacity for accurate work, and the ability to research and communicate product knowledge. The industry makes extensive use of computerized reservation systems for which graduates need in‐depth preparation, and finally, graduates need to have a realistic view of the industry and its expectations of entry‐level personnel. Thus, it is unlikely that graduates could be appropriately prepared without some opportunity to gain and reflect on practical experience during their time in the program. The tourism and travel industry attracts people who love vacationing and want to be in the middle of other people’s vacations. To be successful in the hospitality industry, it helps to be extroverted, personable, tactful and able to be empathetic to the needs of others. Analytical thinking is another important quality, particularly for travel agents and tour guides. Tourism and Travel agents plan itineraries for their clients, scheduling and booking tours, lodging and reservations for all activities. The agent has to learn the clients’ expectations, including the destination, type of transport, travel dates, budget, required accommodations and special requirements. Tourism and Travel agents also work with travel providers, such as hoteliers, tour guide companies, airlines, car rental companies, tourism bureaus and others in the hospitality industry. Agents make clients aware of various promotions offered by travel providers. This course describes how the travel and tourism industry can be categorized, and classify hotels in terms of their size and target markets. The course classifies hotels in terms of their levels of service, and ownership and affiliation. Student will review characteristics of business, pleasure/leisure, group, and international travelers. The course will also identify factors that influence travelers’ buying decisions. This course will explain what a mission statement is, and describe how goals, strategies, and tactics are used to accomplish a hotel’s mission. The course describes how hotels are organized and explains how functional areas within hotels are classified. Students will review the functions performed by departments and positions within the rooms division. The course identifies the functions performed by other divisions and departments within a full-service hotel. The course also examines organization of the front office, including traditional work shifts, alternative scheduling practices, and the purpose of job descriptions and job specifications. Students will be introduced to front office operations and review stages of the guest cycle. The course describes front office recordkeeping systems and front office documents. The course describes the front desk and its support devices, and examines the services and equipment of a hotel’s telecommunications area. The course also identifies and describes property management systems used by the front office. The course describes the function of typical reservation reports, and summarizes other reservation considerations. Students will review steps of the registration process, examine the function of preregistration, and identify preregistration activities. The course describes the function of registration records and registration cards, and identifies factors that affect room and rate assignments during the registration process. The course outlines procedures for establishing the guest’s method of payment at registration. The course will also discuss creative registration options, describe techniques used to upsell guests during registration, and explain how to handle situations in which guests cannot be accommodated by the hotel. This course introduces students to office procedures for communicating with guests, and describes communications between the front office and other hotel areas. 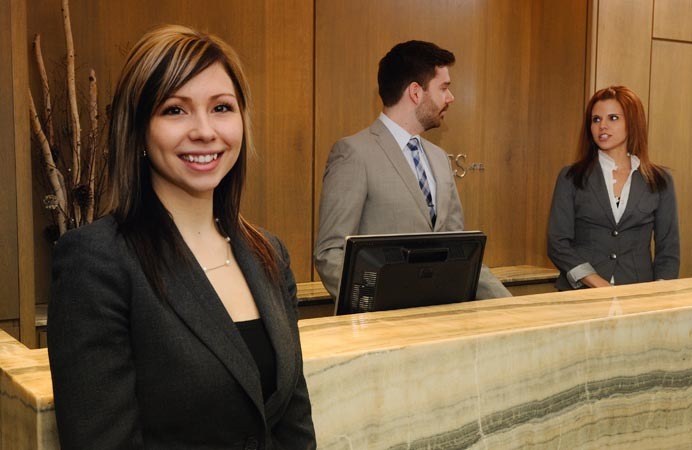 The course identifies typical service requests that guests make at the front desk, and describe general approaches to handling guest complaints.